This lecture covers the basics of Y-DNA testing for males, and how to find DNA projects and testing companies. An introduction to analysis of the DNA test results is given. This chart demonstrates Y-DNA inheritance from a couple on the top row to living descendants on the bottom row. Squares represent men. Circles represent women. Navy represents those with Y-DNA inherited from the man at the top of the chart. If a researcher is interested in learning more about the Y-DNA of the man at the top of the chart, there is only one living person who can provide a DNA sample—the man represented by the navy square on the bottom row. 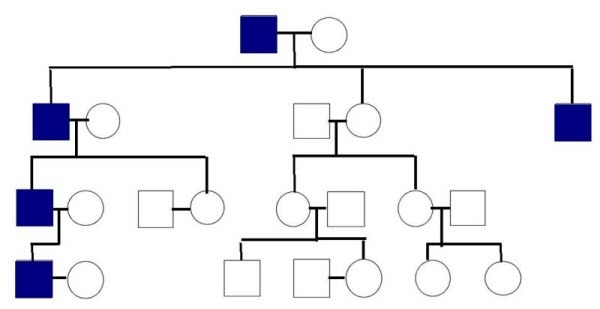 Although the second row indicates two sons and one daughter were born to the couple on the top row, we can see that only the son on the left side of the diagram has descendants who have inherited the Y-DNA of the man on the top row. This discussion is based on the Y-DNA portion of the lectures "Paternal Lines: Using Y-DNA" and "GATA GACC! DNA and Genetic Genealogy." A Y-DNA test will provide each tester with a list of the markers tested and that person's value for that marker. Marker names are shown in this certificate as "DYS # xyz." The marker values (or alleles) are compared to determine whether testers have a common ancestor. In many surname projects, the marker values are listed in long rows of numbers with differing markers in different colors. 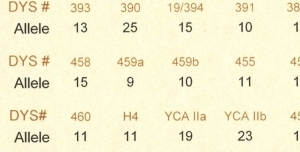 The chart below from the Parker Family DNA Project1 is a different representation of the marker values shown in the certificate above. These charts can be difficult for some people to interpret. By taking small groups of matches and combining the paper trail lineage with the DNA results, we can determine if the paper trail and DNA results confirm or contradict one another. The chart below uses a subset of data from family group one in the Parker Family DNA Project to demonstrate one way Y-DNA test results can be charted to help in that analysis. Some of the genealogical research listing the lineages was done by other descendants of Henry Sr. Some of the research has been confirmed, some has not yet been confirmed. When you start analysis of your family group you will need to start with the lineage information provided by the other testers. That lineage will need to be confirmed using the Genealogical Proof Standard.2 It is also important to understand this discussion does not include every possible explanation for the DNA test results. It demonstrates one of the first steps in the analysis and one possible explanation for the results. Because there are two George W.'s in the chart their birth years will be included in the discussion of the chart. This chart was created in a word processor table. Diagramming tools can be used to make a prettier graphical representation. A word processor is used to show that every computer user has a tool in which they can do a similar analysis even if no graphic program is available. Each box contains the man's name, possibly a birth year, and information on the DNA marker values attributed to that man based on the analysis. Some include migration routes as indicated in the paper trail (for example, Henry Sr. in row 1 lived in NC, SC, IL, and AR according to documents located so far). The bottom row does not include the names of the DNA contributors. For privacy purposes the chart ends with the name of the tester's ancestor who was born in the mid-1800s. Parker Family DNA project tester numbers are included instead. For example, in the leftmost box of the bottom row, a descendant of George W. born 1854 was assigned number P20 in the Parker Family DNA project, a descendant of Perry A. was assigned number P63, and so on. Following the assigned number is a dash and an indication of the number of Y-DNA markers tested by each person. Knowing the number of markers tested is important as the DNA differences may change when and if all of the men test the same number of markers. We can only compare and analyze the smallest number of markers that have been tested in common by all of the men. We might hypothesize about what expanded tests will show, but until those tests are done we will not be able to prove that hypothesis. P20 tested 25 markers at FTDNA and is a descendant of Henry Jr.'s son George W. born 1854. P63 tested 67 markers at FTDNA and is a descendant of Henry Jr.'s son Perry A.
P17 tested 37 markers at FTDNA and is a descendant of Henry Jr.'s son John W.
P363 tested 46 markers at Ancestry.com and is a descendant of Henry Jr.'s son John W.
P31 tested 25 markers at Family Tree DNA (FTDNA) and is a descendant of George W. born 1836. The descendant of George W. born 1836 (P31) has no mutations from the most common DNA signature for Parker family group one. The most common DNA signature is referred to as the modal. This means it is likely Henry Sr. also had the modal values and passed them to George W. born 1836. Descendants of other sons of Henry Sr. can be tested to confirm this. 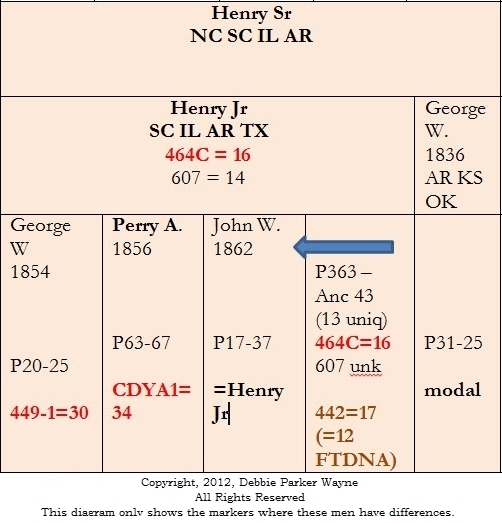 All of Henry Jr.'s descendants who have been tested at markers 464C and 607 have the same value for those two markers. This indicates these marker values were likely passed from Henry Jr. to all of his sons. We would not normally expect Henry Jr. to have two markers different from his father. But, as more DNA tests are done, we are learning more about the possibilities and probabilities for DNA inheritance. Several reports of a man having two or three different marker values from his father or brothers have been reported. See this August 2008 list discussion on "father and son with a 2 marker difference. "3 A private list contains several similar discussions of more changes than expected between father and son. We have also learned that some markers seem to change more often than others. These are referred to as fast changing or fast mutating markers. See http://www.worldfamilies.net/marker for more information.4 One of the differences between Henry Sr. and Jr. is 464C which is one of those fast mutating markers. A case can be made that it is possible for Henry Jr. to have these two mutations from the DNA values of his father. Two of Henry Jr.'s descendants have one additional mutation each that could have occurred in any generation between Henry Jr. and the person who tested. P20 has a different value for 449-1. P63 has a different value at CDYA1. Both of these are fast mutating markers. Remember this chart does not show the persons born after the mid-1800s. There are four to six generations that are not shown in this chart. Several mutations could have occurred in those generations. P17 is a descendant of Henry Jr.'s sons John W. P17 has only the two mutations we see in all descendants of Henry Jr.
P363 tested at a later time than the other descendants and tested at Ancestry.com instead of Family Tree DNA. Ancestry.com tests 46 markers. Thirteen of those are not tested by Family Tree DNA. Family Tree DNA also tests markers that are not included in the Ancestry.com test. We can only compare the markers included by both companies. Ancestry.com does not test marker 607 so we do not know if P363 matches the others on that marker. P363 does match the other descendants of Henry Jr. on marker 464C. If P363 matches the others on marker 607 he could be shown as a likely descendant of Henry Jr. even if there was no paper trail to show this kinship. The DNA and the paper trail research lead to the same conclusion. One contradiction is that there are more mutations than would normally be expected between Henry Sr. and the descendants of Henry Jr. But all of the mutations expect marker 607 are fast mutating markers. This fact is used in the proof argument when discussing this contradiction. As with all genealogical research, our conclusion may change if more evidence is found. The conclusions might change if additional markers are tested with results that are inconsistent with the current conclusions. We have to remember that the statistical probabilities given for kinship based on DNA marker values are just that—probabilities. DNA mutations are random and the changes between any two people may fall outside of the probability matrix. We need to use logic to analyze and correlate all of the information from traditional and genetic research, to resolve conflicts, and write a conclusion our peers can then review. With the documentary and DNA evidence we have at this time, a proof argument can be written to support the conclusion that Henry Jr. is a son of Henry Sr. An article on this family has been submitted for publication. Once it is in print a citation to the journal will be added to this page. 1. Parker Family DNA Project (http://web.utk.edu/~corn/parkerdna : accessed 25 June 2012). 2. Christine Rose, Genealogical Proof Standard: Building a Solid Case, 3d ed. (San Jose, California: CR Publications, 2009). 3. "father and son with a 2 marker difference," Y-DNA-PROJECTS mail list, 13 August 2008, Rootsweb.com (http://archiver.rootsweb.ancestry.com/th/read/Y-DNA-PROJECTS/2008-08/1218680347 : accessed 25 June 2012). 4. "Marker and Mutation Comparison," WorldFamilies.net (http://www.worldfamilies.net/marker : accessed 25 June 2012). 5. "Markers that may need to be converted," Ysearch.org (ysearch.org/conversion_page.asp/ : accessed 25 June 2012).